Conveniently transport your Nintendo Switch and all your gaming essentials in this rugged carrying case from Mumba! With a slim and lightweight design, this portable and travel-friendly case can be easily carried solo or in your bag, backpack, or luggage. 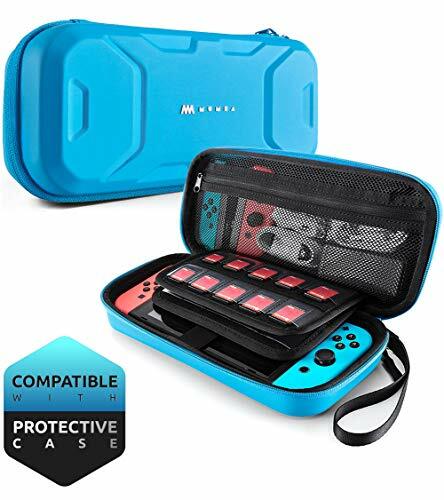 Only the Mumba carrying case offers dual protection from shock and collision with a hard, waterproof shell made of durable EVA material, and a middle padding layer to protect your Nintendo Switch screen and Joy-Con controllers from getting scratched or damaged. The Mumba carrying case also offers maximum storage capacity with room for a Nintendo Switch (including protective case cover and both Joy-Cons attached), dozens of game cards, extra Joy-Cons, cables, and more. (Please note that the carrying case is not designed for larger items like the dock or pro-controllers). The Mumba Nintendo Switch carrying case is perfect compatible with the Mumba Nintendo Switch case cover.